Amitraz As A Contributor To CCD? What’s A Beekeeper To Do? A number of findings regarding the miticide amitraz (as well as the neonicotinoid insecticides) have come to my attention in recent months. The question is, are they red flags, or merely red herrings? Many professional beekeepers have in recent years complained of elevated rates of colony loss  and queen supersedure, peaking during the epidemic of CCD which ran from about 2004 through 2010, but still continuing to some extent today. A ton of investigation by researchers worldwide (including myself) has found that most of the blame for losses during that period can be laid squarely on the deadly troika consisting of the varroa/virus complex, poor nutrition, and Nosema ceranae. And many beekeepers, now having learned how to deal with those colony killers, are enjoying much better success these days. However, beekeeping has not yet returned to the “normal” of the good old days. Some of the best beekeepers continue to suffer from excessive colony morbidity or mortality in their operations, and many report that queens just don’t live for as long as they used to. This leads me to suspect that the epidemic of CCD overshadowed additional problems caused, or exacerbated by, factors other than the deadly troika mentioned above. More specifically, there is considerable evidence that colonies in many operations suffer from the lethal or sublethal adverse effects of pesticides. The second special situation where spraying fungicides during bloom can cause problems is where the honey bee keepers are using the insecticide/miticide amitraz for control of varroa mites in the hive. Most tree fruit growers will remember amitraz as Mitac which was used heavily for pear psylla control in the past. This product was routinely used for synergizing organophosphate and pyrethroid insecticides in crops like cotton where key pests had developed resistance, because it shut down the enzymes insects used to detoxify pesticides. This raises concerns about amitraz being used to treat mites in honey bee hives. While it may be effective in controlling varroa mites now that they have quickly developed resistance to the organophosphate coumaphos and the pyrethroid fluvalinate, adding this synergist to a hive basically shuts off a bee’s immune system to pretty much any pesticide with which it later comes into contact. Oh…my…gosh! Go ahead and read it again! Have beekeepers inadvertently been synergizing (multiplying) the negative effects of miticide residues and agricultural chemicals in hives by their applications of amitraz? I immediately started a correspondence with Dr. Biddinger, which then led me to writing this article, because it only gets more interesting! I run trials of bee health products for companies wishing to bring new products to market. These trials provide me with valuable data on the colony and queen survival rates in carefully monitored groups of hives. What I’ve found is that, in my groups of test colonies, often numbering 48 – 150, that the survival rate of both colonies and their queens is as good as it was in the old days . This fact then raises the question as to what might be different between my colonies and those of beekeepers who are experiencing problems. Let me first state emphatically that I do not owe the difference to my beekeeping. My two sons and I run up to 1200 hives, but much of my time is taking up with research, writing, and speaking engagements. We are nearly always running behind, struggle to keep mite levels down, and ever since we gave up our traditional summer migration, must supplement our hives with protein as they struggle through our long, rainless summer prior to going into a cold, wet winter. I am a poor example of any sort of “exemplary” beekeeper. The only time our colonies are exposed to agricultural pesticides is during almond pollination, and even that is mainly to fungicides and herbicides, rather than insecticides. The rest of the year we keep bees in foothill locations with zero to minimal pesticide exposure. We haven’t applied a synthetic miticide since the year 2000 (other than minor applications in a couple of trials). We sell up to half our brood combs each year in nucs, so there is little chance for pesticide residues to build up in our combs. In essence, my operation could be considered to be a pesticide-free control group which can be compared to typical operations receiving much higher degrees of pesticide and synthetic miticide exposure. I strongly suspect, to no surprise, that this is one reason why we have fewer problems. Practical question: what changed with regard to pesticides around the early 2000’s that may be contributing to today’s colony morbidity and queen failure? Despite much hue and cry to the contrary, I’ve yet to see convincing evidence that it is primarily due to the neonicotinoid insecticides (and have indeed seen much evidence to the contrary). So what other changes in pesticide exposure could be the reason? Everyone on Earth has by now has heard about the putative link between the neonics and colony loss, and there is certainly reason for concern . But has the single minded focus on the neonics distracted us from the negative effects of other pesticides, or their synergisms with beekeeper-applied miticides? This is the problem with tunnel vision. When an investigation focuses solely upon only one suspect, the real culprit could be standing right next to you, quietly chuckling. I’m no defender of any pesticide, but I am a defender of good science, objective reasoning, fair and informed discussion, and common sense. My question is then, could other common hive contaminants withstand the degree of scrutiny that has been afforded the neonics? Another pesticide keeps popping up on my radar. Its use also appears “to be associated with”  elevated colony losses during at least three different time periods. The problem is that I’m not sure whether this is a chicken and egg issue, or whether there is really a case for causality. So, in my usual manner, I’ll give you the facts and evidence, and allow you to come to your own opinion. The pesticide, as you may have guessed, is amitraz, and the way our bees are exposed to it is by beekeepers intentionally putting it into their hives to control parasitic mites. I’ve now done a fair amount of research into amitraz, and to my surprise, I found how easy it can be to build a convincing and biologically-plausible case against this (and perhaps any other) pesticide, provided that you focus your full attention upon it! But when I “ground truth” via practical field reports, I’m not so sure. I realized that this provides me with a good analogy to the shaky case that some have attempted to build against the neonics. Practical application: As an illustration of the complexity of pesticide issues, I’m going to build an illustrative case against amitraz, based upon circumstantial evidence, laboratory research, and speculative hypotheses (the “red flags”), and then weigh them against hard evidence and real-life “ground truthing” to determine whether they are merely “red herrings.” And finally, I’ll share the results of an unbiased field trial that I’m currently running. I’m going to keep switching hats between prosecutor and defense attorney, since, in the case of amitraz, it appears that this is a pesticide that can be of great benefit to beekeepers, while simultaneously having the potential to create significant problems under certain circumstances. We beekeepers would never have considered intentionally introducing an insecticide directly into our hives; that is, until the arrival of the parasitic mites. As first the tracheal mite, and then varroa devastated our operations; in desperation we abandoned our previous phobia of chemicals and soon ourselves became the major source of pesticide exposure to our bees. I’ve detailed how this sad fact initiated a new era of toxicity for the honey bee, not from without, but from within the hive . The first wave of amitraz use was in the late 1980’s through about 1995, during which time commercial beekeepers (illegally) sprayed agricultural amitraz products onto bottom boards or under hive covers in attempts to control the recently-introduced tracheal mite . Winter colony loss rate was quite high during that period of time, and it could have been that amitraz (being ineffective at controlling tracheal mite) may have been doing more harm than good . 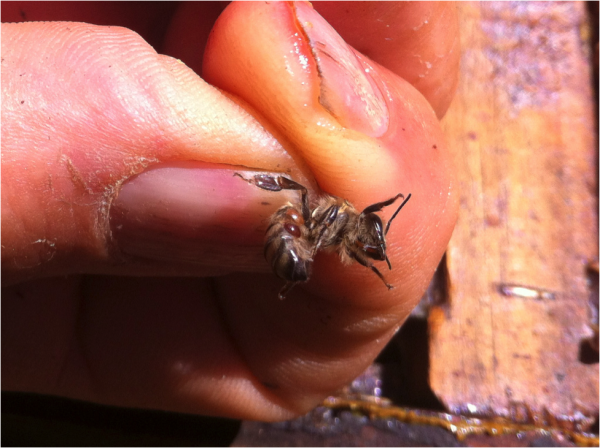 Just as bees developed natural resistance to tracheal mite, we started getting hit hard by varroa. Our salvation was the use of two other synthetic miticides–first fluvalinate (Apistan®/Mavrik®), and then when mites developed resistance to that product, coumaphos (CheckMite+®/CO-Ral®). Note that each of these miticides belong to different classes of acaricides, each with different modes of action. Those who rally the troops about the “extinction” of the honey bee due to CCD seem to forget that we California beekeepers lost about 70% of our hives when tracheal mite first invaded, and then up to 100% of colonies died during the initial varroa invasion, followed by subsequent huge losses when fluvalinate failed. And then we got hit hard again when coumaphos failed in the fall of 2004. At that point in time, the U.S. beekeeping industry was essentially thrown to the wolves, since there were no effective registered chemicals available to manage varroa —forcing commercial beekeepers wishing to save their colonies to experiment with “off-label” uses of agricultural pest control products. The salvation of our industry were products containing amitraz (notably Taktic® or Ovasyn®), applied by various methods. I’ve rarely seen beekeepers as enthusiastic about any product as they were (and are) about Taktic—it is incredibly effective for varroa control, and even more important, inexpensive to apply. Commercial beekeepers rapidly abandoned Mavrik and coumaphos in favor of Taktic . So was it merely coincidental that in short order beekeepers began to complain of unusual symptoms of colony mortality? It’s difficult to tease out any cause and effect relationship during this time period, as the epidemic of “CCD” losses, as well as the focus upon the neonicotinoids, distracted us from questioning whether the increased use of Taktic was contributing to the problem. 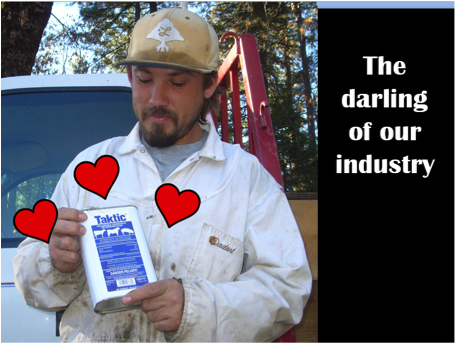 The last correlation between the use of amitraz and an increased rate of colony mortality comes from Ontario, Canada. Despite the fact that neonicotinoid seed treatments had been used there for some time, beekeepers suddenly and loudly began to complain of pesticide kills and colony losses in the year 2012 . Was it merely coincidental that amitraz had been registered there for varroa control in 2011? A teaser: note that in the two cases above, beekeepers began to blame neonics for colony morbidity shortly after they started using amitraz for mite control. The above three correlations between the use of amitraz and a subsequent increase in colony mortality certainly grab my attention. But does correlation imply causality? We’ve all seen any number of graphs being used as “proof” that some danged thing or another is the cause of something else because there appears to be a correlation. 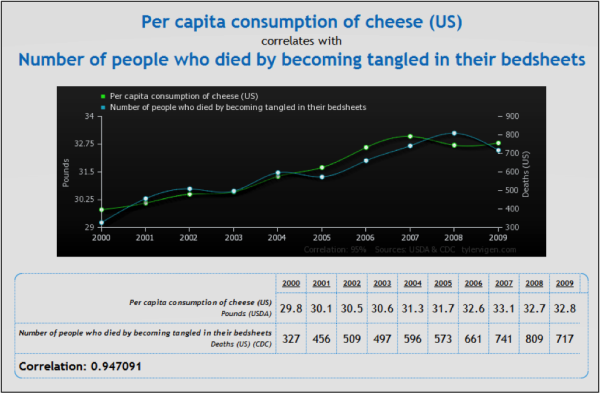 But one must always keep in mind that correlation does not necessarily equate to causality. By pure chance, we can expect that there will be some factors that may appear to have a relationship (as in the phrase “linked to bee decline”), but unless they fit your belief system, we would discount any such relationship as being preposterous (Fig. 1). Figure 1. With a 95 percent correlation, there surely must be some sort of relationship here! The anti-cheese campaigners will use this as strong evidence for their case, and of course the evil cheese industry will predictably and strongly deny this obvious threat to our well being! Chart thanks to http://www.tylervigen.com/. Ontario was pretty tight with their data during the investigation. The only summary of their residue analyses that I can find was published in 2013 , and certainly links spring bee kills to planting dust. Surprisingly, it doesn’t even mention any detects of amitraz or its metabolites, so it’s impossible for me to discuss whether there was any relationship. In Alberta, however, where Apivar strips have been widely used since 2009 , beekeepers are enjoying remarkable growth in colony numbers . So my assessment to date is that any “link” between the use of amitraz and any increase in colony mortality is pretty weak. Let me assure you, despite its faults, I am not writing this article to trash amitraz; indeed, I encouraged the manufacturer of Apivar® to bring that excellent product to market. In defense of amitraz, let me make perfectly clear that I know of a great many beekeepers who would likely not be in business today were it not for amitraz. And many of them have not suffered from exaggerated colony loss; indeed, some of them are major almond pollinators, as well as being suppliers of queens and packages to the rest of the industry. Based upon that on-the-ground evidence, one might be tempted to let amitraz off the hook, but upon closer look, the story grows more complex. Amitraz has a long history of successful use as a varroacide. It was yet another Silver Bullet—a treatment or two a year kept mites under control, and the active ingredient didn’t show up in honey. Those in some European countries have used Taktic or registered amitraz strips for decades, and a number of U.S. beekeepers have applied it to their colonies since the 1990’s. But things are about to change in the U.S…. For those who haven’t heard, the registration of Taktic in the U.S. has been voluntarily withdrawn by the registrant (Fig. 2). Figure 2. 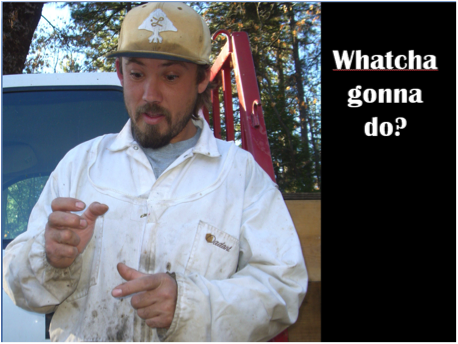 With these two slides I tried to hint at this year’s AHPA convention that something was in the works–suggesting that beekeepers have a Plan B at hand. On August 6, EPA accepted the voluntary withdrawal of registration of Taktic. Existing stocks may still be sold, but beekeepers should be ready for EPA to start cracking down on off label use of agricultural amitraz products. The legal product, Apivar, is a far better method of application of amitraz, but unfortunately, considerably more expensive. It would be wise for beekeepers to rotate Apivar treatments with other active ingredients to delay the inevitable development of resistance to this product by varroa. Thanks to my son Eric for posing for the photos. The loss of Taktic has the potential to seriously shake up the commercial bee industry. Any number of beekeepers have told me that they can’t imagine how they could stay in business without it. That statement has credibility when you consider that when Taktic was temporarily unavailable a couple of summers ago, that a number of beekeepers lacking a “Plan B” simply let their colonies go without treatment, often with disastrous results. Practical consideration: on the other hand, the illegal use of Taktic has given those same beekeepers an unfair competitive advantage over those of us who stick with the more expensive registered treatments, yet must still compete with the scofflaws in the open market for pollination services and honey sales . Practical note: if you are used to applying Taktic in fall for a quick knock out of mites prior to the formation of the winter cluster, you may be disappointed by the slower results from Apivar. Research from Saskatchewan suggests that in areas in which winter comes on quickly, spring treatment may be the better option . People put their trust in our governmental regulatory agencies to protect us from harmful foods, medicines, and pesticides. Few take the time to deeply investigate the potential down sides to exuberantly-advertized off-the-shelf medicines or treatments. But the truth is, that we beekeepers should practice due diligence by doing our homework about the things that we put into our hives. The last thing that I wish to do is to be alarmist, but the rest of this article will deal with possible side effects from amitraz. I’ve looked at a number of incidents of amitraz poisoning in humans (typically by either accidental or intentional ingestion of liquid formulations). The agricultural formulations of amitraz are dangerous poisons that beekeepers, should they choose to illegally apply them, would be wise to be very cautious with. Of late I’ve heard of beekeepers fogging amitraz; a California beekeeper who nearly killed himself while doing so is emphatic that this is a very dangerous practice! Apivar strips, properly handled with nitrile gloves, appear to pose little risk to the health of the applicator . One thing that we’ve learned in recent years is about the “legacy effect” of miticide residues in our combs. One reason that beekeepers favor amitraz is that it is nearly insoluble in honey, and the small amount that does dissolve quickly breaks down, mainly into DMPF . The DMPF remains stable in honey for at least 45 days. Amitraz is far more soluble in beeswax, where it completely degrades within a day, also mainly into DMPF, which remains stable for a considerable period of time, but may be further degraded during processing of the beeswax . Practical application: although one’s honey may test free of amitraz, in fact it is the DMPF that exerts its toxic action upon honey bees. Roughly half the original dose of amitraz that dissolves into honey or wax remains biologically active for some time in the form of DMPF. Testing shows that DMPF is an extremely common contaminant of commercial combs. Although amitraz is considered to be “relatively non-toxic to bees”  the chronic exposure of bees to its degradation product in the combs and honey allows for the distinct possibility of it exerting sublethal or behavioral effects upon the bees, or the possibility of synergizing the sublethal effects of other contaminants. So how prevalent is amitraz contamination of combs? By the year 2003, commercial hives were already so contaminated by amitraz, that there was concern about varroa having developed resistance . Later in the decade, Mullin (2010)  detected DMPF in fully 60% of beeswax samples and 31% of beebread samples. Even more recently, DMPF was the third most common pesticide residue in the 451 samples of beebread analyzed by the USDA National Survey from 2010 through January 2014 –present in 23% of samples, led only by the other miticides fluvalinate and coumaphos. By comparison, the neonicotinoids imidacloprid, thiamethoxam, clothianidin, and thiacloprid were found in only 2.9%, 2.4%, 2.2%, and 0.7% of samples, respectively. Practical note: amitraz started to contaminate hives just as the neonics came into the market. And amitraz residues are detected far more frequently and at higher concentration. Sometimes beekeepers put so much amitraz into their hives that excessively high residue levels are found. In these cases, enough DMPF may diffuse from the wax into the lipid-rich beebread or jelly to affect the bees. Overall, typical levels of DMPF found in combs are in the 100-200 ppb range (but up to nearly 40,000 ppb). Although amitraz is considered to be “relatively non-toxic to bees” , the chronic exposure of bees to its degradation product in the combs and honey allows for the distinct possibility of it exerting sublethal or behavioral effects upon the bees, or the possibility of synergizing the sublethal effects of other contaminants. How about residues from Apivar strips? 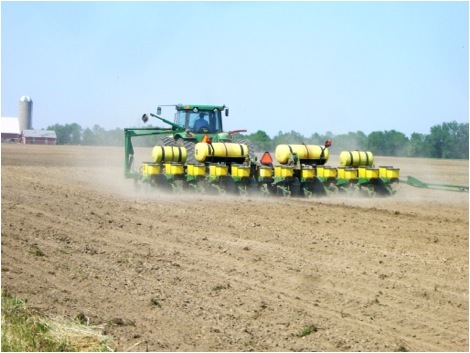 A recently submitted residue depletion study was carried out during 1998 in accordance with the principles of GLP . Two strips containing 500 mg amitraz were suspended in each of 6 hives for a period of 6 weeks. The hives had been treated with the product previously, twice a year, for 3 successive years. Samples of honey and wax were removed at intervals and analyzed…The highest mean residues in honey, 225 ppb expressed as amitraz, were found 2 days after the end of the treatment. The mean residues in honey declined to 103.5 ppb at 4 days after the end of the treatment and 75 [ppb] at 15 days…Residues in wax were much higher and did not correlate with the residues in honey. Mean residues in wax were 44,700 ppb, expressed as amitraz, 2 days after the end of treatment. Although mean residues in wax depleted to 4,700 ppb at 10 days after the end of treatment, there was an apparent resurgence in mean residues in wax to 72,900 ppb at 15 days after the end of treatment . Figure 3. Applying amitraz via a slow-release strip such as Apivar ensures that mites are exposed to the active ingredient over three reproductive cycles. This allows amitraz to exert its sublethal effects on mite reproduction. The total amount of amitraz in an Apivar strip is about twice the amount that is commonly applied by commercial beekeepers in a single grease patty . So let’s do some math! Using the formula for the Daily Consumption Hazard that I proposed in a previous article , and using the published LD50 values for amitraz , I calculate that a bee consuming even the most highly contaminated pollen would only get a tiny fraction of the lethal dose . On the other hand, the contact dose that bees might get from rubbing against highly-contaminated comb might approach the range of lethality. However, that doesn’t necessarily mean that those combs are going to poison your bees. The amount of DMPF in honey is typically very low compared to that in the wax. So the question is to what extent the DMPF then diffuses from the beeswax combs through the bees’ cuticle. I have not yet seen data on this, but since a treatment with liquid amitraz only kills mites for a few days, I suspect that little escapes the wax into the mites. Following that logic, it’s likely that little diffuses into the bees. Reality check: I don’t hear reports of serious bee mortality after applications of Taktic, suggesting that typically-applied doses are below the range of direct lethality . And the pesticide-adverse French beekeepers who have been using Apivar strips for 15 years apparently don’t see serious problems with them. The surprising thing to me, after watching the failures of fluvalinate and coumaphos as varroa quickly adapted to develop resistance to those chemicals, is how long amitraz has remained effective as a varroacide. When I checked to see how amitraz has fared in other countries, the results were mixed. I have no idea as to whether that is due to the different modes of application (more intense application will exert greater selective pressure on the mite), or whether it is due to the randomness of mutations for resistance. In Argentina, where amitraz has also been extensively used against varroa, a recent study suggests that mites in some operations have become at least 35 times more resistant to the chemical . Similar reports come from throughout the world (Italy, Portugal, Argentina, and France; reviewed by Pires ). Surprisingly, a friend in Chile tells me that amitraz failed to control mites there after only three seasons of use. On the other hand, Semkiw , testing amitraz strips (similar to Apivar) in Poland, where the active ingredient has been used for 30 years, obtained up to 95% efficacy in eliminating varroa, with the majority of the mites dropping in the first three weeks, but full efficacy not obtained until 8 weeks. Here in the States, Sammataro  found signs of varroa resistance to amitraz as early as 2003, wryly noting that “Surprisingly, mites also showed resistance to amitraz, which is not a registered acaricide.” And last year, Eischen  found resistant mites in some operations. Practical application: the development of resistance to amitraz by varroa is a ticking time bomb for commercial operations that have become dependent upon this treatment (Fig. 4). It would be wise to become familiar with alternative methods of mite management. At the least, one should rotate amitraz with other treatments in order to help delay the inevitable development of amitraz-proof mites. And of course, use the more effective (and legal) strips. Figure 4. Many commercial beekeepers monitor mite levels by applying a strong dose of amitraz to a hive, and then checking for the mite drop on a sticky board the next day. The problem with this assessment method is that if your mites start to develop resistance to the chemical, you could be blindsided by an undetected mite buildup. For example, in France, where Apivar is authorized and used on a large scale since 1995, Veto-pharma takes part every year in an efficacy study. The efficacy of Apivar remains very high despite a very intensive and repeated use for many years in a lot of countries worldwide . Practical applications: Semkiw’s detailed study is worth reviewing. Note that the strips (2 per strong colony) were applied in the last weeks of August as the colonies began to curtail broodrearing and naturally reduce their populations. He found that the greatest control was obtained in those hives with less brood, and in the year when the temperature was warmer. Amitraz is an unusual compound in many ways. In the first place, amitraz itself needs to be “bioactivated” to exhibit its main insecticidal/miticidal actions. Amitraz is a mirror-image molecule that gets split into the toxic “half molecule” DMPF . The apparent reason that amitraz is more toxic to varroa than to bees is that the honey bee does not seem to bioactivate the parent compound as readily as does the mite. For the rest of this article I will focus upon the effects of DMPF. Practical tip: amitraz has an extremely low vapor pressure, and must be distributed within the hive by physical contact by bees with the chemical. There would be no expected distribution by vaporization of the product within the hive. 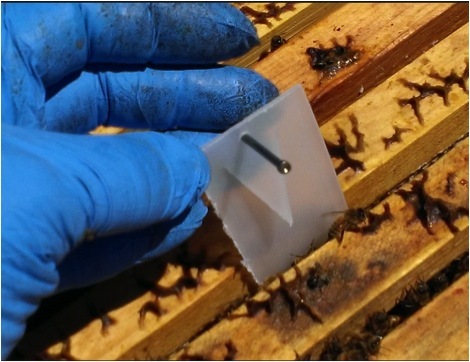 When Apivar strips are applied while colonies are clustered due to cool weather, providing the colonies with supplemental feed may encourage movement of bees throughout the cluster, and result in better distribution of the product. In general, it appears that “the biological action of amitraz is more due to its sublethal effects, rather than to a direct lethality” . And what might those sublethal effects be? DMPF is, as are many synthetic insecticides, a neurotoxin, exerting its effects on the nervous system, especially upon the octopamine receptors of the bee brain. These receptors are involved in the processing of sensory inputs, antennal motor outputs and higher-order brain functions (learning and memory). Practical application: in other words, amitraz tends to affect behavior more than being a simple poison. 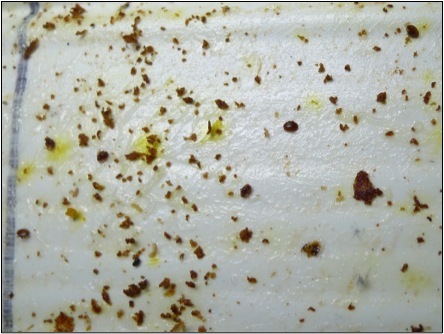 And although beekeepers love to see dead mites dropping onto a sticky board after an application of Taktic, it is likely more effectively (and safely) applied in a time-release strip such as Apivar, where even slight paralysis of the mites might inhibit their ability to hitchhike on bees, to identify the critical nurse bees upon which they must hitch a ride, or to reproduce. This brings us to the most trenchant question in varroa management: What is the Achille’s Heel of the mite? The answer that jumps out at me is its ability to successfully reproduce. Think about it–a thousand mites in a hive would be nothing to worry about if they were somehow unable to reproduce. They would simply be groomed off the bees or eventually die of old age. To my mind, targeting mite reproductive success should be the strategy of our breeding programs, and is likely the most efficient mode of action for chemical treatments. Practical application: keep in mind you don’t have to kill a single mite in order to control varroa–all one need do is to handicap the female mites’ ability to evade grooming and to hitchhike to, identify, and enter a new brood cell (Fig. 5). Figure 5. I lifted this emerging bee from its cell; on her abdomen was a mother mite and her daughter. These tiny blind mites must not only run the gauntlet in a hive of bees that will attempt to kill them, but also properly indentify a nurse bee upon which to hitchhike a ride to a new brood cell, and then dismount at the right moment so as to enter the cell of a larva of the appropriate age. Anything that alters the mites’ behavior could affect their success at reproduction. Along that line, the reason that a treatment with amitraz is effective at controlling ticks (a close relative of varroa) on dogs and livestock is that in addition to direct lethality, it also induces sublethal behavioral effects in the parasites, such as hyper excitation, inactivation, repellency, anti-feeding, detachment, excessive dispersal, and poor reproductive success . The same apparently holds true with varroa. Although commercial beekeepers like to see the immediate drop of mites from a treatment with Taktic, some tell me that they get better results with several weekly lower-dose treatments. And this is exactly what Apivar strips do—they slowly release amitraz over a period of eight weeks (roughly three mite reproductive cycles), driving the mite population to very low levels. With the sustained-release strips, it’s not necessary for amitraz to directly kill the mites; all it need do is to mess with ‘em. Practical application: amitraz may exhibit multiple modes of action against the mite, and this may be one of the reasons why mites have a hard time developing resistance to the product. Santiago  determined that the lethal concentration (LC50) of amitraz when sprayed on worker bees was 1636 ppb. Note that this level is well below the level of contamination commonly measured in the combs of treated hives. Also of note is that he found amitraz to be 7000 times more toxic to varroa than to bees. We beekeepers eventually and unfortunately learned of the sublethal effects on bees (especially reproductives) from comb residues of fluvalinate and coumaphos. Can bees suffer similarly from amitraz? Amitraz has long been applied to hives by a variety of methods, and beekeepers and researchers have observed a variety of relatively minor adverse effects upon the bees (such as temporary reduction in egglaying). Let’s review some recent studies. Hillier  found that workers exposed to amitraz “defecated large volumes of feces during our experiments” (this could lead to transmission of nosema spores in the hive). Papaefthimiou  found that even tiny doses of amitraz more than doubled the heart rate of bees. Loucif-ayad  found that amitraz “caused a considerable decrease in the main biochemical compounds of the hemolymph of adult workers from emergence to foraging age, and to a lower extent in the proteins and lipids in the body tissues of 0- and 7-d-old workers.” Perhaps most tellingly, Frazier  found that “dead and dying bees collected around colonies in association with corn [instead of being poisoned by agricultural pesticides] had only residues of 2,4-DMPF at 5,160 ppb.” The obvious implication is that the unobservant beekeeper might miss the damage that he may be doing to his colonies with unapproved treatments with amitraz. Santiago also tested fluvalinate, and found its LC50 to be nearly identical to that of amitraz. Since I know of no beekeepers who observed notable mortality after application of fluvalinate, I’d tend to discount that amitraz causes significant worker mortality. The product had no effect on bee mortality, size of the brood-comb, hive activity, hive weight or the size of the honey harvest when used at twice the indicated dose. At 5 times the indicated dose, hive activity was slightly reduced on very hot days. Finally, my data suggest that amitraz could contribute to significant brood/pupa bee losses if concentrations ranging from 25-400 ppb are present in larval food. Larvae exposed to 25 ppb of amitraz in their food could result in an estimated 50% loss of bee brood, whereas larvae exposed to 400 ppb could result in an estimated 92% loss of brood… my data do not suggest that amitraz is an appropriate acaricide for varroa control. Dr. Ellis, in a subsequent study, found amitraz to be only slightly toxic to bee larvae . We beekeepers just can’t win for losing! Last year, Pettis  came to the alarming conclusion that exposure to amitraz appeared to double the relative risk of bees becoming infected by nosema. This finding is supported by a more recent study by Cutler , who found a very high (61%) correlation between DMPF residues and nosema levels in bee samples from the Canadian maritime provinces. I’ve noticed that a number of beekeepers report nosema problems after colonies are returned from almonds to cooler areas. Since many commercial guys treat with amitraz right after almonds, this certainly raises the question as to whether there is a link between amitraz exposure and susceptibility to nosema. It’s hard to defend amitraz on this one. This should not be a difficult question to answer with incubator studies on caged bees. Of interest is that a study by Botias  suggests that the effectiveness of Apivar strips against varroa may be lessened if the colony is infected by nosema. Practical application: until we learn more, it might be wise to avoid using amitraz if nosema is a problem for your bees at that time of year. Dr. Eric Mussen and I were in the audience in 2011 when Elizabeth Dahlgren  presented her research on the comparative effects of miticides upon virgin queens and workers. We immediately turned to each other when she said that unlike with other tested synthetic miticides, to which workers are more susceptible than queens, that queens appeared to be more susceptible to amitraz than were workers. Consider the implications—the subtle effects of amitraz on queens might go unnoticed if all one is looking for is whether there is worker mortality. And when I checked the literature, I came across a mention that Lubinevski  in Israel observed that fumigation with amitraz for varroa often led to the supersedure of queens. All I hear about these days is how queens in some operations have such poor survivability (Fig. 6). Could amitraz be involved? Delaplane and Berry , in addition to apparent behavioral effects on workers, noted a fourfold increase in supersedure cells in colonies treated with Taktic. Figure 6. Even the most carefully-reared and thoroughly-mated queen can fail to live up to her potential if pesticide residues effect changes in her production of pheromones or the viability of the sperm held in her spermatheca. Of perhaps greatest concern, Pettis  has reported at recent conferences that treatment with amitraz at any of three tested doses may cause up to half of a queen’s stored sperm to become non viable. Again, I do not wish to be alarmist, but in recent months, the above findings have really gotten me questioning whether colonies suffer more of a hangover from off-label amitraz treatments than we have been aware of. I began this article with the concern that amitraz may synergize the toxic effects of other pesticides. A team led by Dr. Marion Ellis published findings in 2013  that pre exposure to amitraz made fluvalinate 20 times more toxic to bees, and coumaphos 5 times as deadly. Those two chemicals are by far the most frequent contaminants of honey combs today. Especially worrisome is the synergism with the pyrethroid (fluvalinate), since Frazier  points out that the greatest overall pesticide exposure to bees is from pyrethroids  (for some unfathomable reason, the pyrethroids are unaccountably ignored by the anti-neonic activists). But it gets even worse! Remember the teaser from early in this article about the Ontario beekeepers not complaining about neonics until they started using amitraz? Could it possibly be that amitraz also synergizes the lethal effects of neonicotinoids? Could this be one of the missing pieces in the neonic puzzle? Of course, I searched the literature. I couldn’t find a direct answer from the voluminous pile of research on neonics and bees, but toxicologists working with other insect and arachnid species have looked into it. Prullage , publishing in Veterinary Parasitology, found that amitraz synergizes with fipronil, the systemic insecticide that beekeepers in France blamed for killing their bees (and which a number of beekeepers use off-label to control Small Hive Beetle). And then I discovered that Ahmed, publishing in the Journal of Medical Entomology [62,63] found that at least with mosquito larvae, amitraz exhibits a profound synergistic effect not only with some pyrethroids, but also with three neonicotinoids . Jopien  filed a patent based upon the synergistic action of amitraz upon imidacloprid on cotton bollworm. And according to Rousch , DMPF is apparently an even more effective synergist than the parent amitraz. Possible practical application: amitraz increased the toxicity of imidacloprid to mosquito larvae nearly twentyfold! Again, OH…MY…GOSH! Could beekeepers be making all the careful calibration of neonicotinoid levels in the registration of agricultural products moot by introducing a chemical synergist into their hives that might make said neonics twenty times more toxic to their bees? Was it the neonics, or was it what the beekeeper put into the hive (Fig. 7)? Figure 7. A question: Does exposure to beekeeper-applied miticides then make those bees more susceptible to the neonicotinoids (as from this planting dust) and other agricultural chemicals? And if so, who is then responsible for the resulting “adverse effects”? We must ask ourselves, is this biologically plausible? Unfortunately, it is. The neonics, properly applied, result in residues in nectar and pollen in the low single-digit parts per billion, about twenty times less than the level at which toxic effects start to be observed. As an analogy for the degree to which those effects might be biologically enhanced by a twentyfold synergism, imagine the difference in behavioral effects in a human from drinking one cup of coffee, as compared to chugging the caffeine in twenty cups at one time (gives me the jitters just to think of it!). Ground truthing: OK, before we all start hyperventilating, let me remind you that what I’m intentionally doing in this article is trying to show how easy it is to build a case against a pesticide, analogous to the case against the neonics. So yes, I’ll later suggest measures that beekeepers could take to avoid such synergies, but we must keep in mind that plenty of commercial beekeepers have used amitraz products for years, but don’t complain about pesticide issues. Clearly, the potential synergistic effect between amitraz and the neonics deserves deeper investigation. I hope that some research groups will devote some attention to this question. In any case, so as long as I’m at it, let’s go even further out on a limb to see whether we can try to pin CCD on amitraz. Again, is it biologically plausible? Yes, there is unimpeachable evidence that residues of DMPF are common in combs. But is there a biological mechanism by which those residues could contribute to the sudden depopulation of hives? Once again, there is. The model for the progression of sudden colony collapse (CCD) that I published in 2010  details how a combination of stressors and chilling can result in an in-hive epidemic of altruistic hive abandonment by sick workers, leading to positive feedback loops that can snowball into sudden colony depopulation. This model has been embraced by USDA researchers , and supported by subsequent mathematical modeling . A key factor in CCD is the initiation of precocious foraging by younger workers . This precocious foraging can be due to being chilled as brood, by a shortage of beebread, or by infection by viruses and/or nosema . It can additionally be induced by the disappearance of the field force, which then forces the remaining young bees to begin foraging at a younger age. And when I dug deeper, I found that there is yet another way to cause precocious foraging in young workers—by feeding the bees a bit of the neurotransmitter octopamine in sugar syrup [72,73]. And what has this got to do with amitraz? Well, amitraz is activates the octopamine receptors in the bee brain, as well as increasing octopamine levels in their blood. OK, we can speculate on the above, but does it happen in real life? Apparently it does. Dr. Chris Cutler performed a study for the Nova Scotia Beekeepers Association in 2012 , shortly after they started using amitraz in earnest. His data suggest that some of them had applied it exuberantly, since he found residues of DMPF in beeswax at up to a breathtaking 39,300 ppb! He found, as did Pettis, a strong correlation between DMPF levels and nosema in fall samples. Additionally, since the mode of action of amitraz involves interactions with octopamine receptors, hemolymph octopamine (known to be involved in learning and memory in honey bees) was measured as a secondary indication of the potential effects of amitraz on the learning ability of honey bees. What he found was that treatment with amitraz increased octopamine levels in bee hemolymph, suggesting that amitraz could indeed lead to precocious foraging. Obviously, no one observes sudden colony depopulation after treatment with amitraz in any form. But there is no reason not to suspect that anything that increases precocious foraging might shift the tipping point at which a colony starts to spiral into collapse. The queens from the insecticide-naïve stock superseded at a greater rate than those from stocks with a history of pesticide exposure. Why was the supersedure delayed? Was it due to problems with the queen, or from behavioral changes in the workers? Are the “black bees” more susceptible than Carniolans? To what degree have bee stocks from agricultural areas become resistant to pesticides? Let’s say that you order a bunch of queens from a breeder whose hives are rarely exposed to neonicotinoids (as in California), and then use them to start colonies that will be exposed to corn planting dust. Will they suffer more than those reared from bee stocks better adapted to neonics? Practical application: when I visit beekeepers in corn/soy areas, those running locally-adapted stock seem to have fewer complaints about queen failure. Have their bees developed resistance to the neonics? Practical application: if neonics do indeed induce an elevated rate of queen failure/supersedure, then would treating your hives with amitraz at the same time that they are exposed to neonics via planting dust or spray applications make them more susceptible to queen failure? Or more likely to suffer from other adverse effects of neonic exposure? Cutler did not observe negative effects in a large-scale field trial in Canada . Nor did Piling in a long-term trial in France . But I put my most faith in beekeeper observations from the Canadian prairie, where colonies consume a pure diet of neonic-laden canola pollen for long periods of time, yet don’t suffer from elevated rates of supersedure. Many of these beekeepers started using amitraz in recent years, so we should watch for synergistic effects between DMPF and clothianidin in their colonies. I wrote this article with the intent of modeling how we should objectively evaluate any pesticide. The discussion should weigh the benefits vs. the risks. The end result would rarely be a call for a complete ban of that pesticide, but rather a consideration of how it can be best used, and when and where its use should be restricted or avoided. We should also attempt to maintain a wider perspective, realizing that no pesticide is applied in a vacuum; we must consider timing of application, interactions with environmental factors, synergies with other natural or manmade toxins, and effects on immunity, behavior, and pathogens. And as additional information becomes available, we should be ready to readjust our assessment appropriately. Practical applications: there is no question that amitraz is an incredibly effective varroacide, with a long history of successful use; the registered Apivar strips are clearly the best way to apply the product. I have no way of knowing whether the potential for amitraz to synergize with the neonics is a bombshell or nothing to worry about—I hope that some of our researchers will be able to elucidate the field relevance of this interaction. Direct lethality from pesticides, miticides, and their degradation products. Legacy effects from residues that persist in the combs. Sublethal and behavioral effects of pesticides, including varroacides. The tradeoffs between the benefits of mite control vs. the costs of miticide adverse effects. Pesticide/miticide interactions with pathogens, such as nosema and viruses. Different effects on workers than on queens and drones, or upon sperm viability. Amplification of pesticide toxicity due to synergism with beekeeper-applied miticides. Timing of application of mite treatments, which may coincide with exposure to other pesticides, or seasonal colony stressors. If what you’ve been doing works for you and you’re not complaining, then maybe no need to change. Consider cleaning up your own act before you start pointing the finger at other suspects. Amitraz is most effectively (and safely) applied in a time-release strip such as Apivar. Avoid contributing to pesticide synergies—amitraz may not be your best choice if your bees are exposed to certain agricultural chemicals. Time the application of amitraz treatments to avoid other pesticide exposure. Rotate contaminated combs out of your operation. In order to slow the development of miticide-resistant varroa, alternate treatments with different active ingredients. Have a Plan B at hand should varroa develop resistance to your favored miticide. Learn to use products that don’t leave persistent residues. Use locally-adapted varroa- (and perhaps pesticide-) resistant bee stocks. It started out writing this article as the introduction for a field test I ran this spring to determine whether the application of amitraz slowed the buildup of nucs. As you can see, the introduction grew until it morphed into this article. So I’m publishing the trial as a separate article. Thank you to the individual beekeepers and clubs (listed at ScientificBeekeeping.com) who funded this research and writing through their donations. I receive no financial consideration from Véto-pharma® or any other pesticide manufacturer. Thanks to Dr. David Biddinger for his helpful suggestions. And to my friend Pete Borst for digging into the Cornell library for me. And to Véto-pharma® for spending millions of dollars to bring a legal amitraz product (Apivar) to market in the U.S. In truth, I find little evidence that the rate of winter colony loss in recent years truly lies that far outside the range of historical norms, especially since the introduction of the parasitic mites. Typically 95-99% survival November through March. The quality of some recent studies on the neonics has greatly improved. To use a favorite phrase of anti-whatever zealots. Apiguard® thymol gel had not yet been registered, and it would be a few years before MiteAway® formic acid pads hit the market. As of this writing, oxalic acid is yet to be registered in the U.S. Unfortunately, I can’t provide my usual hard numbers, since sales data and records for off-label use of amitraz are either proprietary or secret. I hear from other beekeepers in the region that the media reports from Ontario have been primarily from a few beekeepers with a vendetta against the neonics, so it’s difficult to sort out the truth. Health Canada (2013) Evaluation of Canadian Bee Mortalities Coinciding with Corn Planting in Spring 2012. Open access. Medhat Nasr, Provincial Apiculturist, various presentations. Let’s do the math. The cost of 4 Apivar strips per treatment, say twice a year, would be over $20, not counting the labor involved in inserting and later removing the strips. That gives the scofflaws a competitive advantage of about $20 in their almond pollination price, or adds 33 cents per pound to an average 60-lb honey crop. It will be interesting, to say the least, to see how this all works out! Mullin, C (2014) Honey bee toxic interactions with formulation ‘inerts’ and pesticide residues frequently found in U.S. apiaries. Open access. Wilson, G (2010) Investigations of Apivar® Efficacy: Fall 2009. Beelines (Saskatchewan) Issue #117. Corta, E, et al (1999). Kinetics and mechanism of amitraz hydrolysis in aqueus media by HPLC and GC-MS. Talanta 48:189-199. Korta, E, et al (2001) Study of acaricide stability in honey. Characterization of amitraz degradation products in honey and beeswax. J. Agric. Food Chem 49 (12): 5835–5842. Sammataro, D, et at (2005) ‘The resistance of varroa mites (Acari: Varroidae) to acaricides and the presence of esterase’, International Journal of Acarology, 31(1):67-74. Open access. Rennich, Karen, pers comm. Latest published report: Rennich, K, et al (2012) 2011-2012 National Honey Bee Pests and Diseases Survey Report. Open access. GLP = the gold standard of “Good Laboratory Practices.” I also edited this quote to change µg/Kg to ppb. I hesitate to publish directions for off-label use of pesticides. I say this with the caveat that I’m not sure how the LD50 value for amitraz correlates with that of DMPF. Additionally, the figure for contact in the citation above is sort of meaningless, since it does not specify dose per bee. Generally, oral toxicity is greater than contact toxicity. Obviously, beekeepers with the slightest degree of intelligence will adjust their treatments to levels below that which causes obvious major bee mortality. However, that doesn’t mean that affected bees don’t die from behavioral effects impacting the bees once outside the hive. For instance, Frazier observed that “Dead and dying bees collected around colonies in association with corn had only residues of 2,4-DMPF at 5,160 ppb,” strongly suggesting that those bees were killed by an application of Tactic. Frazier, et al (2011) Assessing the reduction of field populations in honey bee colonies pollinating nine different crops. ABRC 2011. Maggi, MD, et al (2010) Resistance phenomena to amitraz from populations of the ectoparasitic mite Varroa destructor of Argentina. Parasitol Res 107:1189–1192. Pires, S, et al (2005). Current effectiveness of amitraz against Varroa in Portugal. 39th Apimondia International Apicultural Congress, pp. 78. Apimondia. Dublin, Irlanda. Failing in Portugal. Semkiw, P, et al (2013) The amitraz strips efficacy in control of Varroa destructor after many years application of amitraz in apiaries. Journal of Apicultural Science 57(1): 107-121. Sammataro, Diana, Untalan, Pia, Guerrero, Felix and Finley, Jennifer(2005) ‘The resistance of varroa mites (Acari: Varroidae) to acaricides and the presence of esterase’, International Journal of Acarology 31(1): 67-74. Dr. Frank Eischen, USDA, in prep, pers comm. DMPF is the abbreviation for 2,4- dimethylphenyl formamide, which constitutes about half the initial degradation products; the other degradates do not appear to exhibit toxic effect. See Hong, JY, et al (2009) Determination of acaricides in honey by solid-phase extraction and gas chromatography / mass spectrometry. Bull. Korean Chem. Soc.30(1): 61-66. Open access. Hollingworth RM and AE Lund (1982) Biological and neurotoxic effects of amidine pesticides. In, Coats J.R. (Ed. ), Insecticide Mode of Action, Academic Press, New York, 1982, pp. 189–227. Beeman, RW and F Matsumura (1978) Formamidine Pesticides-Actions in Insects and Acarines. In, Pesticide and Venom Neurotoxicity, B. Shankland, ed, Springer. Santiago, GP, et al (2000) Comparing effects of three acaricides on Varroa jacobsoni (Acari: Varroidae) and Apis mellifera (Hymenoptera: Apidae) using two application techniques. Fla. Entomologist 83: 468-476. Open access. Hillier, NK, et al (2013) Fate of dermally applied miticides fluvalinate and amitraz within honey bee (Hymenoptera: Apidae) bodies. Journal of Economic Entomology, 106(2):558-565. Papaefthimiou, C, et al (2013) Biphasic responses of the honeybee heart to nanomolar concentrations of amitraz. Pesticide Biochemistry and Physiology 107(1): 132–137. Open access. Loucif-ayad, W, et al (2009) A scientific note on the impact of acaracides on the nutritional biochemistry of Apis mellifera intermissa (Hymenoptera: Apidae). Apidologie 41(2): 135 – 137. Frazier, et al (2011) Assessing the reduction of field populations in honey bee colonies pollinating nine different crops. ABRC 2011. Toth, P (2009) Lethal and sublethal effects of imidacloprid and amitraz on Apis mellifera Linnaeus (Hymenoptera: Apidae) larvae and pupae. M.S. Thesis, U. of Florida Open access. Ellis, J (2011?) Determining LC50 values for pesticides affecting larval honey bees. Open access. Pettis JS, et al. (2013) Crop pollination exposes honey bees to pesticides which alters their susceptibility to the gut pathogen Nosema ceranae. PLoS ONE 8(7): e70182. Cutler, C (2013) Pesticides in Honey Bee Hives in the Maritime Provinces: Residue Levels and Interactions with Varroa mites and Nosema in Colony Stress. Open access. Botias, C, et al (2012) Nosema spp. parasitization decreases the effectiveness of acaricide strips Apivar®) in treating varroosis of honey bee (Apis mellifera iberiensis) colonies. Environmental Microbiology Reports 4(1): 57–65. Lubinevski, Y, et al (1988) Control of Varroa jacobsoni and Tropilaelaps clareae mites using MavrikÒ in A mellifera colonies under subtropical and tropical climates. ABJ 128: 48-52. Johnson RM, Dahlgren L, Siegfried BD, Ellis MD (2013) Acaricide, fungicide and drug interactions in honey bees (Apis mellifera). PLoS ONE 8(1): e54092. Frazier, J, et al (2011) ibid. Prullage, JB, et al (2011)The combined mode of action of fipronil and amitraz on the motility of Rhipicephalus sanguineus. Veterinary Parasitology 179 (4): 302–310. Ahmed, MAI & F Matsumura (2012) Synergistic actions of formamidine insecticides on the activity of pyrethroids and neonicotinoids against Aedes aegypti (Diptera: Culicidae). Journal of Medical Entomology 49(6): 1405-1410. When I asked another toxicologist to review the above paper, he questioned the statistical analysis as far as the calculated confidence limits, but did not deny that there appeared to be some degree of synergy. Pages 250-252 in Roush, R and BE Tabashnik (1990) Pesticide Resistance In Arthropods. Chapman and Hall. Drs. Judy Chen and Jay Evans, pers comm. Kelly M. Brown, KM (2013) Mathematical Models of Honey Bee Populations: Rapid Population Decline. Thesis, University of Mary Washington. Open access. Khoury DS, Myerscough MR, Barron AB: A quantitative model of honey bee colony population dynamics. PLoS One 2011, 6(4):e18491. Khoury DS, Barron AB, Myerscough MR (2013) Modelling food and population dynamics in honey bee colonies. PLoS ONE 8(5): e59084. 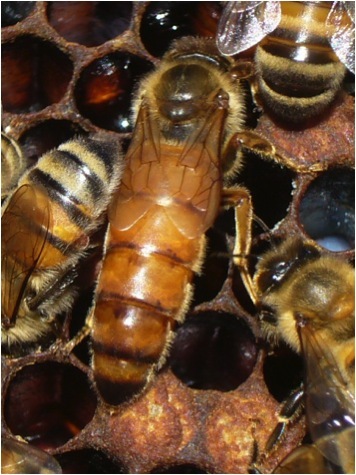 Goblirsch M, Huang ZY, Spivak M (2013) Physiological and behavioral changes in honey Bees (Apis mellifera) induced by Nosema ceranae infection. PLoS ONE 8(3): e58165. Schulz, D.J., and G.E. Robinson (2001) Octopamine influences division of labor in honey bee colonies. J. Comp. Physiol. A, 187: 53–61. Sandrock, C, et al. (2014) Impact of chronic neonicotinoid exposure on honeybee colony performance and queen supersedure. PLoS ONE 9(8): e103592. At the high end of field realistic. Pilling, E, et al (2013) A four-year field program investigating long-term effects of repeated exposure of honey bee colonies to flowering crops treated with thiamethoxam. PLoS ONE 8(10): e77193. The researchers didn’t mention whether the queens were marked, but colony survival would have depended upon successful natural supersedure had any queens been lost. I asked the authors for additional information; at least some of the colonies were treated with Apivar.